Property and Malta go together like a horse and carriage. We love buildings and building them, as any glance around from your front door or hotel lobby will show. But do we love searching to buy them? Anyone who has searched the property websites of Maltese real estate agents will know that it’s as time consuming and frustrating an exercise as foot-slogging around their high-street offices. Earlier this year, Malta resident Dominic Watson decided that enough was enough. 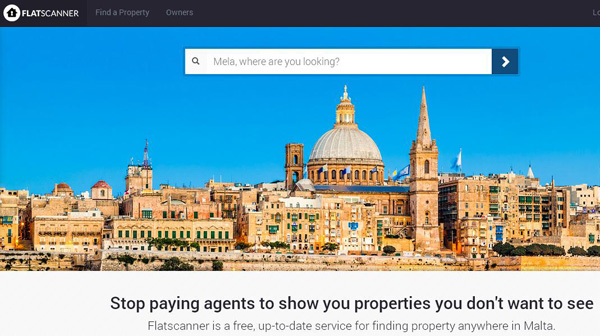 Having been on the receiving end of real estate agents (often less than user-friendly) websites, he recently launched Flatscanner, a property search website he says is ‘set to revolutionise’ the Maltese property market. After generations of real estate agents dominating the Maltese property industry with high fees, Flatscanner is poised to be an innovative tool for buyers and tenants, and also for property sellers and landlords wishing to by-pass agency fees and go direct to market. Offered as a free search platform, Flatscanner.net provides an outlet for sellers and landlords to list properties online for interested buyers and renters to view. Allowing users to view properties online in real-time by simply selecting their area on the map, this original idea aims to change the way in which the Maltese residents search for their next home. It’s simple and fast for property owners (sellers and landlords) to create a listing with multiple photographs of the property and details such as whether the place has a pool, accepts pets and so on. The first 500 listings at Flatscanner.net are free and the slots are running out fast; after that, there’s a yearly fee of €30 a listing, with the prospect of discounted deals for sellers with multiple listings. “I’ve had a great response so far from property owners in Malta – so many people seem genuinely keen to sign up and use this service. The 500 free listings are almost all gone, which is, to be honest, must faster than I expected them to,” Dominic says. For tenants and buyers, searching for new properties has also been made much easier. By simply scrolling in on the provided map, the user will instantly be able to see exactly where available properties are located. They will also be provided with up-to-date information on the property as well the opportunity to contact the owner directly, therefore avoiding the need to hire and pay for a real estate agent. Despite the boom in popularity for Flatscanner’s service, Mr Watson says that there are several services provided by agents that would still be necessary throughout the property-hunting process, such as evaluations and photography. For more information, see Flatscanner.net or email:admin@flatscanner.net. See also Flatscanner on Facebook.